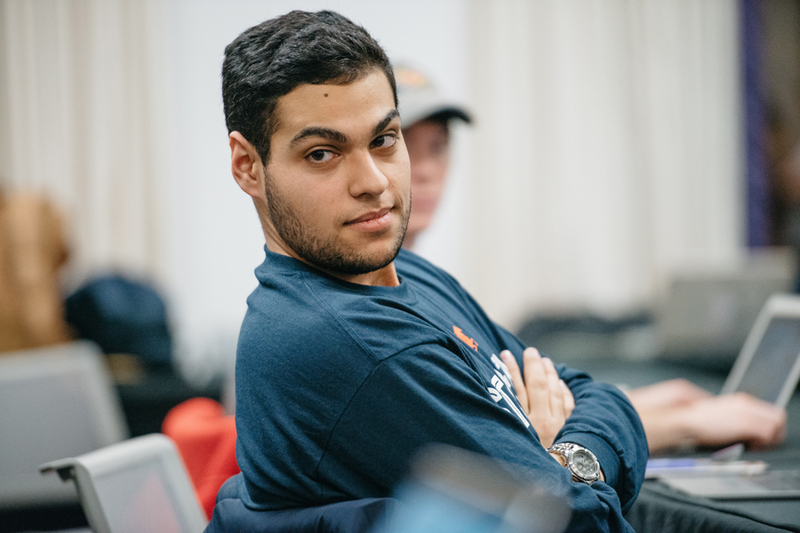 Associated Student Government senator Bassel Shanab listens to debate on an amendment to election rules that would allow the president and vice president to endorse candidates. ASG ultimately changed the rules to prohibit those endorsements in their Wednesday Senate meeting. Associated Student Government approved new rules in Wednesday’s Senate meeting for candidates in the upcoming spring elections. The seven-person election commission, which was elected earlier this month, introduced legislation with three proposed changes for the Senate to debate. One of these changes added language to prohibit the current president and vice president from endorsing candidates. Dillon Saks, chair of the election commission, who was also on the commission last year, told The Daily some senators were against endorsements because they could sway the opinion of the electorate. Saks said the rules were changed last year for the first time in several years to allow the president and vice president to make endorsements. The amendment reversing that decision was debated at length among senators. Senator Bassel Shanab introduced an amendment, which eventually failed, to the election commission’s proposal that would keep endorsements in place. He said endorsements would make it more clear to students which candidates would maintain or differ from the current administration’s policies. “People who vote, usually there’s a reason why they vote, they know what’s going on or they can always just google it. We’re in college,” the Weinberg freshman said. The other amendments proposed in this legislation more clearly defined the responsibilities of the election commissioner and reduced the amount of paper flyers candidates are allowed to post. Another senator introduced an amendment to specify the amount of money allocated to campaigns, which was before listed as proportional to the student activities fee, or about $200. An amendment in response proposed that amount be raised to $300, which was passed in the final bill. Saks said this also spurred some debate. “Arguments made in favor of that were it’s much better for campaigns to be able to get more money,” Saks said. “More money is correlated with higher voter turnout because you’re getting the word out more,” Saks said. Senate also elected three members to their Senate Reform Ad-Hoc Committee, which will recommend ways to improve representation and functionality within ASG. Chief of staff Lars Benson said this committee will begin their work this quarter by examining how Senate is conducted. “(The committee will compare Senate) to the way they do things at other universities, talking to interested students, faculty members, talking to administrators and overall trying to get a picture of how to represent students the best way possible,” the Weinberg senior said.